Mah Sing Group Berhad’s The Coastal’s Professional Suite at Southbay City in Batu Maung, Penang, is expected to rake in RM150mil in sales. Group chief executive officer and executive director Ng Chai Yong said that the units, from 571sq ft to 1,318sq ft, were priced from RM581,000. “The Professional Suite provides buyers with a freehold contemporary office space with customisable layout in a resort-like environment,” he said when launching The Coastal during the company’s 20th anniversary in Batu Maung recently. The Coastal offers two towers over 2.8 acres of freehold land, where the low density development consists of a total of 156 units of professional suites, 100 units of residential suites and 12 units of shoplex. It will offer clubhouse facilities such as swimming pool, pool lounge, hanging garden, gymnasium, playground as well as sky decks with breathtaking views of Penang’s blue waters. As a special anniversary celebration, Ng said Mah Sing was giving a Buyer’s Appreciation package and a Buyer-Get-Buyer reward package for loyal customers. “The two month-long promotional package will also have new buyers receiving exclusive prizes,” he added. Mah Sing’s Southbay City, an integrated development which has a value of RM2.09bil, sits on 34.5 acres of prime land with sea frontage, offering excellent convenience and complete resort-like facilities. 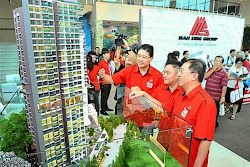 To date, Mah Sing has a total of five projects in Penang forming some 7% of the remaining gross development value and unbilled sales of RM3.3bil from its 48 projects in Malaysia. Penang, said Ng, was slated to deliver some 10% of the group’s sales target for 2014. In addition to the launch of The Coastal, there was also a host of events during the anniversary celebrations. There was a Kid’s Corner with children’s activities such as photo frame-making, iPad games, balloon animal clowns and a captivating bubble artist performance to keep the children entertained while their parents were occupied.